Now with a new foreword by Brother Andrew, Each New Day is a collection of short yet profound devotions for every day of the year from the heart of Corrie ten Boom. Based on incidents from Corrie's fascinating life, each entry illustrates scriptural principles and attests to God's faithfulness. The result is a year-long candid reminder of Christ's victory over sin, Satan, and death; of God's promises and care; and that each new day brings a chance to serve and love God more. 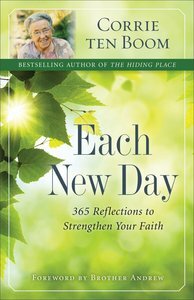 About "Each New Day: 365 Reflections to Strengthen Your Faith"